We would like to thank you and Janet for a once in a lifetime experience in the Holy Land. From day one, this journey has been the work of God. Our last minute addition to the trip was no accident and truly the work of God. The trip itself was well organized and it shows that both of you put a lot of time and effort into making it a memorable and unforgettable experience for all the pilgrims. The food selection was delicious. Amer did a fantastic job of the historical background of each of the sites we visited. He gives us a perspective we could never find in a guidebook. He was a true treasure on our pilgrimage. Also David’s navigating us safely through the streets to all the destinations so very impressive. We know it is a challenging task getting us around in each city. Special thanks to Janet for bringing up the rear, ensuring no-one gets left behind, pointing out washrooms and keeping Steve honest. I will always treasure our moments in the Church of the Nativity! It is amazing how everyone bonded as a group and people we didn’t know a couple of weeks ago, have become good friends. The Ann Arbor folks made us feel welcomed even though we were from Chicago. It was a great honor and I greatly appreciate you for inviting me to share our testimony with the group. We know it touched many souls. It definitely has encouraged us. We greatly appreciate you allowing our former pastor Fr. Edward Pelrine to assist in the celebration of Mass with Fr. James. It was his suggestion that we join your group on this pilgrimage to the Holy Land. 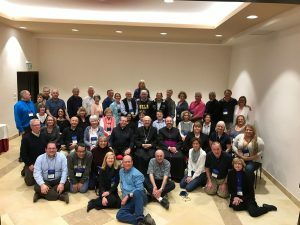 Thanks again for your great work to help keep Christians in the Holy Land. We saw how they live out the Gospel each and every day under tremendous pressure. Finally, we would like to thank Corporate Travel and their team for making the arrangements. They did a great job on such short notice. God bless you and your ministry in service to our Lord. All of you are in our prayers. Someday we hope and pray to see you and Janet again on another pilgrimage. Have a blessed Lent and a Happy Easter! Arrival in Israel, Very Safe & Quiet. Enjoy! All the pilgrims arrive safely except one priest from Nigeria who missed his flight but will join us tomorrow. Everyone is tired from the long flight but excited and enthusiastic. We are all appreciating Fr. Dan Long, especially after his first Mass by the shore of Galilee. Here is the first homily which was exceptional. Enjoy the video of their arrival and our time at the Sea of Gallilee. It was quite fun celebrating the Feast of the Holy Family in Nazareth where I gave my talk about the Holy Family where they lived for 30 years. We also renewed our wedding vows in Cana of Galilee and had Mass atop the mountain of Transfiguration. They homily was excellent again. Enjoy! Great day in northern Galilee driving along the Lebanese and Syrian border. We have a lot of kids with us on this family pilgrimage and they are unbelievably wonderful. We celebrated Mass at the Primacy of Peter Church on the shore of the Sea of Galilee. This Is where Jesus asked Peter if he loved him and then told him to be the Shepherd of His sheep. For another remarkable homily, click here. 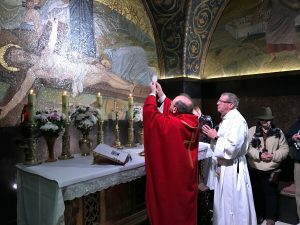 Enjoy today’s video of our 3rd day in Israel following the footprints of our Lord and our Lady, the apostles and the Saints. Another great day in Galilee visiting the Mount of Beatitudes, Multiplication of Loaves and Fish and Mass at Capernaum (Watch the homily here). Then we ate St. Peter’s Fish before driving south toward Jerusalem. Before arriving in Jerusalem we stopped to visit the Visitation were Mary had walked 100 miles to visit her relative Elizabeth. Then we arrived at our beautiful hotel in Jerusalem, the Notre Dame Center. Enjoy the video. All Day Bethlehem from Mass to Dance! We started the day at 3:45 AM. But everybody thanked us later. Join us as we walk the Via Dolorosa caring our crosses with Jesus to Calvary and then for Mass at the Tomb. We also visited the Western Wall, met with the Bishop of Jerusalem and more. Enjoy! Even though it was raining part of the day we had a marvelous bunch of experiences. Mass at Gethsemane is always moving but the homily made it all the more a tearjerker. Mount of Olives, Mount Zion, Upper Room, Prison of Jesus and “shout out” from Ave Maria Academy. Enjoy! Our final day was for and blessed. Enjoy! For that homily, click Here. Watch the 90 minute video of this pilgrimage below. We love taking families to the Holy Land, but many people cannot travel during Spring and Fall due to work or school schedules. This is annual pilgrimage is our answer to that challenge. Same great itinerary and leaders, but tucked in perfectly over the Christmas break. Stay home for Christmas and be back before work or school in January. You’ll enjoy their favorite hand-picked hotels, delicious meals including some amazing dinners experiences away from the typical hotel buffet. You’ll benefit from Steve and Janet’s knowledge, experience and teaching after their 150+ previous trips to Israel and the Middle East since 1995.